What's in the OSGeo-Live 11.0 reboot? We will only support a 64 bit distribution, (32 bit will be built but not tested or officially supported). Most projects have at least minor tweaks required for the docs, some have outright errors. We are asking each project to, check their project overview, run the application on an OSGeo-Live VM (10.5 or a recent nightly build), run every step of the quickstart, update if required, and tell us when done. Once verified, we will add the project back into the OSGeo-Live 11.0 builds. We will call on all projects to test their projects and quickstarts again in an OSGeo-Live 11.0 beta. For specific project comments, see the OSGeo-Live status spreadsheet, column T "11.0 Comment", and column U "10.5 Doc Review". What applications and versions should be included on OSGeo-Live 11.0? What versions of projects should be on OSGeo-Live? Are there any new projects which should be on OSGeo-Live? Are there any projects which should be dropped from OSGeo-Live? To help install the latest stable version of the software. To verify Project Overview and Quickstarts are both up to date and in line with our documentation standards. You can see results of our first pass review in our status spreadsheet , column T "11.0 comment", and column U "10.0 Doc Review". OSGeo-Live (http://live.osgeo.org) is a Lubuntu based distribution of Geospatial Open Source Software, available via a Live DVD, Virtual Machine and USB. You can use OSGeo-Live to try a wide variety of open source geospatial software without installing anything. How can decision makers make good decisions about complex topics which address community needs and reflect community values, incorporating community engagement and earning community trust? How do you attract the attention and contributions from people, acknowledging that we are in an era of information overload and competing priorities? How do you facilitate conversations about complex and intricate issues, acknowledging that it requires substantial time to fully understand and then debate concepts? How can you assess comprehensive community opinion on complex subjects, acknowledging that most people don’t have time to engage in the study or debate. How do you avoid inappropriate bias from vested interests, acknowledging that vocal minorities (companies or individuals) may promote self serving principles contrary to the interests of the majority? How do you gain trust from communities in presented information? How do you manage communication overhead from a large community, finding and promoting the best ideas? (Increasing the signal-to-noise ratio). How can people with a good ideas know they will be heard, and hence be encouraged to participate, noting the best ideas for complex subjects will be time consuming to develop and express? (Increase voice-to-signal ratio). In answering these questions we can learn from the communities behind established Open Source Software projects. 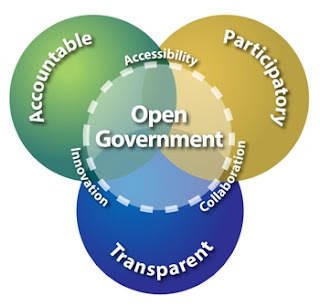 Most of the principles behind Open Government are inherited from Open Source best practice, which in turn are based on morals found in gift economies such as family gatherings and local community groups. Established Open Source communities typically have embraced Merit-ocracy, Do-ocracy, Reciprocity, Respect, Modularity, Pragmatism, Sustainable Practices, and have attracted Strategic Funding. Each of these points should be considered in detail as to how they should be applied in the Open Government context. Open Source projects typically are started by a small volunteer base. All the team know each other intimately. Leaders organically evolve, based on meritocracy and do-ocracy. If the project successfully grows, it builds a technical base which becomes too big to maintain on volunteer labour alone. The project either hits a glass ceiling, or attracts external funding to resource core activities (such as project coordination). Australian Open Government has grown to a size comparable to large established Open Source projects and should be managed and resourced accordingly. Ways of Working: The Forum [will] meet at least every two months, in a location rotated between capital cities. Ways of Working: Forum members [will] not be remunerated, but that its community members be reimbursed by government for reasonable travel costs. Structure: The Forum [will] comprise not more than 16 members ... with equal representation from government ... and the community. Question 1: Are there any other functions the Forum should usefully perform? Question 2: If you do not agree with the single forum model, how do you think another model should work? Question 3: Are there other ways of working you think the Forum should usefully adopt? Question 4: Are there any other criteria or guidelines that should inform the appointment of community members to the Forum? There is a significant mismatch between the apparent workload, the accountability that should exist, and the expectation that leadership should come from unfunded volunteers. This should challenge our underlying human morals and ethics. For forum members to provide valuable leadership, they should allocate substantial time analysing, debating and deciding on issues. This would equate to multiple days per week, which is more than most volunteers have available to them. Note that you want to attract committed people already playing leadership roles in open project(s). As well as being morally questionable, I'd expect that having the Australian government expect forum members to work for free is counter to Australian labour laws. I would expect that nominated government employees would be paid to participate as part of their daily work. This will create a mismatch in effort and influence that can be applied by government employees verses community members. If community members are instead paid to participate by an external employer, one should question likely conflicts of interest. If continuing with unpaid forum membership, the scope of tasks expected of forum members should be reduced to be in line with typical capacity of volunteers. The "Purpose" for the Multistakeholder Forum should be accompanied by realistic time and task commitment expectations of forum members, such that candidates and the community have a clear understanding of what should be done. As well as aiming for social diversity, the forum would benefit from having a multi-disciplinarian team. Question 5: How should a selection panel to recommend Forum appointments be composed? Question 6: Should nominations to the Forum be published? Question 7: Having regard to the desirability to appoint Forum members without unnecessary delay, is there a better way to administer the nominations and appointment process? If forum membership is treated as a paid position, then candidate selection should be treated with the same privacy applied to standard job hiring. If membership is unpaid, then a public process could be considered. For instance, each candidate could provide a brief statement about themselves. The community can then vote on potential candidates to help short list candidates. The final selection should go to the selection committee who considers community votes when doing face-to-face interviews. Question 8: Should appointments to the Forum be staggered? Question 9: How should any mid-term vacancies be filled? More relevant is "How should the Forum be refreshed?" In order to ensure history from one panel to the next, only a maximum of half the panel should be updated in any election cycle. Question 10: How can the Forum best hear and respond to the range of community perspectives on open government? Define a clear vision and set of principles which casual members of the community can quickly assess and agree or disagree with. Trace all actions back to these principles. Acknowledge the diversity in your community's level of interest and time commitments and adjust accordingly. Make use of tools which efficiently capture crowd wisdom. Eg: Allow comments on posts, and allow communities to vote up/down comments based on merit. Respect the time and value of your community. Treat them as partners rather than a survey point. Adopt tools and processes which enables the community to maximise each individual's value of each contribution. This response is based on my background working within Open Source communities, Open Standards communities, activist communities and local communities. Do these ideas make sense to people with different experiences?